Camping and overlanding don't mean that we have to completely rough it, as they say. Even if the idea is to get away and unplug, it may be necessary to use computers and phones. If the overland adventure involves driving in an RV, the extra power will be needed to take advantage of refrigeration and air-conditioning. 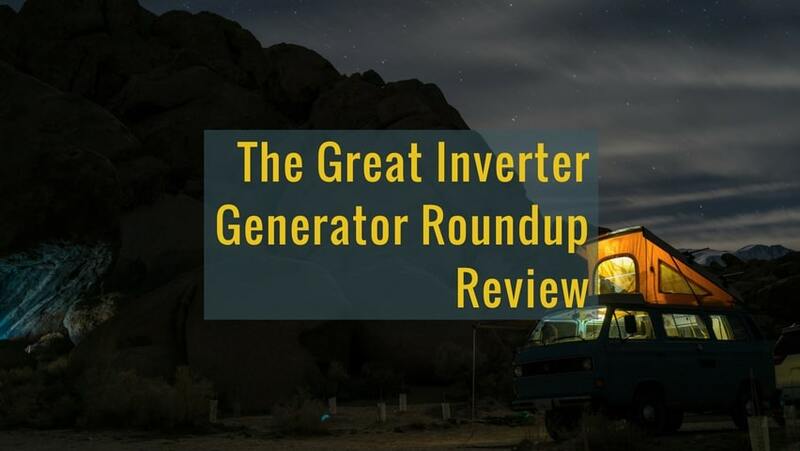 This is when an inverter generator comes in handy and our list of best inverter generators will help you choose the right one for you. Generators have been around for a while now, allowing travelers to keep some modern appliances going out on the road. The idea is fairly simple. An alternator is powered by a gas or propane engine, producing the electricity needed to run electrical appliances. Traditional generators are capable of producing electricity with one hitch; they cannot produce clean energy. Many modern appliances, especially sensitive electronics like computers, can be damaged by power dips and spikes that often occur with generated electricity. This is where an inverter generator comes into play. Clean energy is stable and will not damage precious devices. What follows is a closer look at the best 8 inverter generators, each with its own advantages and limitations. Generator Measurements: 19.3 x 11.0 x 17.9 inches, 44.1 pounds dry. The Yamaha engine has a displacement of 79cc and is a single cylinder four-stroke OHV that is air-cooled. It has a fuel tank with a 1.1-gallon capacity that allows it to run for 10.5 hours continuously at one-quarter load. The EF2000iSv2 is rated at 1600 watts with a maximum of 2000 watts. Amps are rated 13.3 with an increase to 16.7 at maximum. While this generator may struggle with a large RV air-conditioner, it does have the ability to pair with another generator for added power. The Pulse Width Modulation refines the clean frequency and voltage. Not only are there two AC outlets, this inverter also comes with an 8 amp 12 volt DC outlet as well. That extra is great for those needing to charge things like batteries. The minimum decimal level of 51.5 climbs to a peak of 61 dBA at max load. This elegant looking generator comes with a three-year limited warranty. Generator Measurements: 20 x 12.6 x 16.9 inches, 46 pounds. The engine on this product is a single cylinder OHV with 80cc of displacement and air-cooling. Its tank holds 1.06 gallons of fuel providing 7.7 hours run time at a quarter-load or 5.7 hours at half-load. This output is rated at 1600 watts with a maximum of 2000 watts. The amps are rated at 13.3 at 120 volts. Those overlanding in higher elevations, such as the Rockies, may experience a drop in productivity from the generator. Many generators are affected in a similar way. This unit offers many intuitive controls that are easy to use, including a run-time display that shows current power usage. While the two AC plugs are conveniently located at the front, a 12 volt DC plug would have been a nice bonus. An integrated dial eliminates the need for separate controls for start, stop, and run controls. The product is made in the US and comes with a three-year warranty. Generator Measurements: 22.25 x 12.0 x 19.25 inches, 48 pounds. Wen’s engine has a displacement of 79.7cc for a single cylinder OHV that is cooled by forced air. The one-gallon fuel tank provides gas to power the generator for six hours at half-load. Running wattage is rated at 1600 with a surge wattage of 2000. This generator is rated at 13.3 amperages. This inverter is parallel connection capable, a nice feature for those who will require more than the maximum 2000 watts already obtainable. There are automatic shutdown features for both the fuel and oil, just in case we forget to check. It offers two three-prong 120-volt receptacles, one 12 volt DC receptacle, and a 5 volt USB port. The Eco-Mode feature allows for better fuel economy. It comes with a two-year warranty along with EPA III and CARB compliances, certifications important for those of us who are more environmentally conscious. Generator Measurements: 19.7 x 11.2 x 17.9 inches, 47.1 pounds. Pulsar’s 80cc engine is a single cylinder OHV four-stroke that is cooled with forced air. The 1.18-gallon fuel storage provides 4 hours of run time at rated loads or 8 hours at half load. It generates 1600 watts at normal load with a maximum of 2000 watts. It generates 13.3 amps at 120 volts. Accidental overloading is preventable with the overload warning and shut down of the outlet in question. This a good safety feature in the event a heavy duty appliance is connected to it. At half load or less, this unit can generate power for a long time. Along with two household-style plugs, it comes with a 12-volt car lighter style outlet as well. Noise levels average at about 59 decibels. The warranty on this generator is split. The engine is covered for two years, but the components and labor for only one year. Generator Measurements: 20.0 x 11.4 x 16.7 inches, 46.5 pounds. The EU2200i makes use of a four-stroke single cylinder engine with overhead camshaft at 121cc of displacement. It is cooled by forced air. Wattage is rated 1800 with a maximum of 2200 watts. Current is rated at 15 amps with an 18.3 amps rating at maximum. The smaller 0.95-gallon tank supplies 3.2 hours at full load or up to 8.1 hours at a quarter load. A fuel off switch allows the existing gas to burn off before the engine stops, a feature that helps to prevent stale gas from accumulating in the carburetor. The clean fuel is safe for more sensitive electronics, even if two generators are run together at once. The smaller fuel tank is nursed along with the Eco-Throttle System. While producing 57 dBA at the rated load, the noise level drops down to 48 dBA at a quarter load. At that level, it wouldn’t disturb the surroundings as much as other units do. Both commercial and residential warranties are for three years. Generator Measurements: 21 x 12.5 x 17.35 inches, 54 pounds. As expected, a Briggs & Stratton OHV single cylinder four stroke engine with 110cc displacement powers this inverter generator. The one-gallon fuel tank is capable of supplying a run time of eight hours at a quarter load. Running watts are listed as 1700 with a maximum wattage of 2200. Amps are rated at 14.6 with a maximum of 18.33 amperes. The P2200 is capable of parallel connection. It does run a bit loud, rating at 59dBA at a quarter load, or 57 dBA in Eco-Mode. The two 120 volt AC and single 12-volt dc outlets have circuit protection breakers. A USB connection is also supplied with this unit. A two-year warranty is offered, and the generator is CSA and PGMA compliant. The lack of CARB compliance may prove frustrating for California residents. Generator Measurements: 22.4 x 17.3 x 18.3, 83.3 pounds. This powerful generator uses a Champion four-stroke engine with 171cc of displacement that is air cooled. A 1.6-gallon fuel capacity supplies up to eight hours of run time at a quarter load. A great running wattage of 2800 can climb up to 3100 watts. The running amps of 23.3 may climb up to 25.8 amps as well. The Smart Economy Mode is capable of reducing the electoral load, a feature that lowers the noise level and helps to extend the engine’s life. The technology does not support parallel connections, but this should be okay when considering the out of this inverter. The energy produced is under three percent THD. Outlets include an AC duplex rated at 20 amps, a single outlet at 30 amps, and a 12 volts DC plug-in. The noise level averages about 58.0 dBA. This Champion product is EPA certified and CARB compliant. Champion’s three-year warranty and lifetime technical support are very strong. Read our more detailed review of the Champion 3100-Watt RV Ready Portable Inverter Generator here. Generator Measurements: 26.3 x 24.8 x 22.9 inches, 119 pounds. A 224cc Champion four-stroke engine powers this high output inverter generator. A 3.4-gallon fuel tank supplies it with up to nine hours of running time. On 20 pounds of propane, it can run for up to 10.5 hours. Running watts of gas is 3800 with a maximum of 4750 watts. On propane, the funning watts are 3420 with a maximum of 4275. Gas amps range between 31.7 and 39.6 amperes. The propane range is between 28.5 and 35.6 amps maximum. Either fuel delivers 120 volts to four outlets. One is locking and rated at 30 amps, on is non-locking at 30 amps, and the duplex supplies 20 amperes. Safety tech includes a fuel selector switch, as well as volt guard on all outlets that helps to protect against surges. The power comes with an increase of volume, with 68 dBA measured on average. Champion support is the same as with their other products. Each of these inverter generators is capable of producing clean power that is so crucial with today’s electronics. We do have some recommendations from the list, however. For a first time shopper, the Generac 6866 iQ2000 may be worth looking into. ​The integrated power dial makes operation easy. While it lacks a battery charger outlet, the solid construction and support here in the states should provide a positive experience. No matter if you are off-roading or at home, the Honda EU2200i is a great step up. The ability to power refrigerators and small air conditioners makes it the perfect mate on your overland trips, especially in the middle of nowhere. Proper care should help avoid problems with the plastic housing. For those needing power for larger appliances, the Champion 3800-Watt Dual Fuel is the answer. Multiple fuel sources and great support make this choice a no-brainer for heavy-duty needs!